1.3 GHz Quad Core Processor, dual-SIM with 3G support on both SIM, Android v4.2 Jelly Bean, 16 GB Internal Memory expandable up to 32 GB, 5 MP rear and 2 MP front camera, 7.85-inch full capacitive IPS display, 4000 mAh battery. Bottomline: A decent voice calling tablet with bright IPS display and huge battery. The latest tablet from iBall sports a bright, 7.85-inch IPS display, with 768×1024 resolution. The display quality is excellent, so watching movies and videos is a very pleasant experience on this device. It’s a little bulky at 362 grams, but the device’s dimensions are such that it’s very comfortable to hold. The tablet has an attractive back panel with brushed metallic finish. The tablet has a non-removable 4000 mAh battery, and supports dual-SIM and microSD cards. Both of these can be inserted into the device from the top. The top panel has a microUSB port for charging and transferring data from the tablet to other devices, along with a 3.5mm jack. Power and volume rocker buttons are placed on the top right side. The tablet supports voice calling and is coupled with a 1.3 GHz quad core processor and 1 GB RAM which supports it to run several apps and games smoothly. It’s not made for heavy apps or games, but decent enough for day-to-day operations. 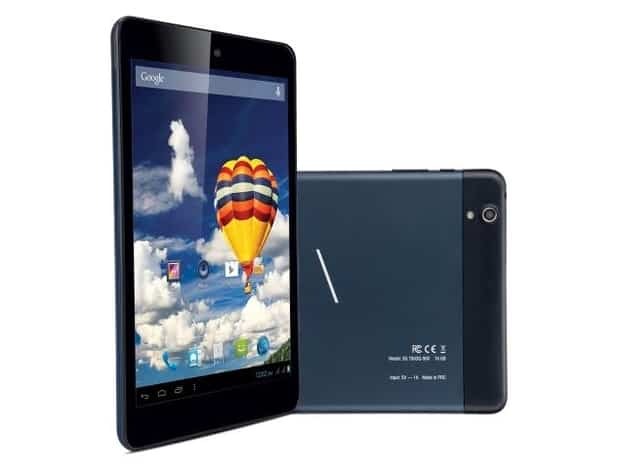 The Slide 3G tab comes with 16 GB in-built memory in which 12 GB is available to the user. It has a microSD slot with up to 32 GB support. The 5 MP camera at the rear performs well in daylight conditions. Thankfully, it has LED flash which makes this tablet capable of capturing moments in lowlight, but attracts noise. Front 2 MP camera is good for selfies and video chats. This Android 4.2 Jelly Bean powered tablet packs 4000 mAh battery that offers day long (8 hours) backup with fair usage. During our battery test, it lasted for about 3 hours and 20 minutes with one full charge while playing videos and movies in full brightness which translates into anywhere between 4 to 6 hours with normal usage.